A parking ticket machine next to the Norwalk Public Library, in July. 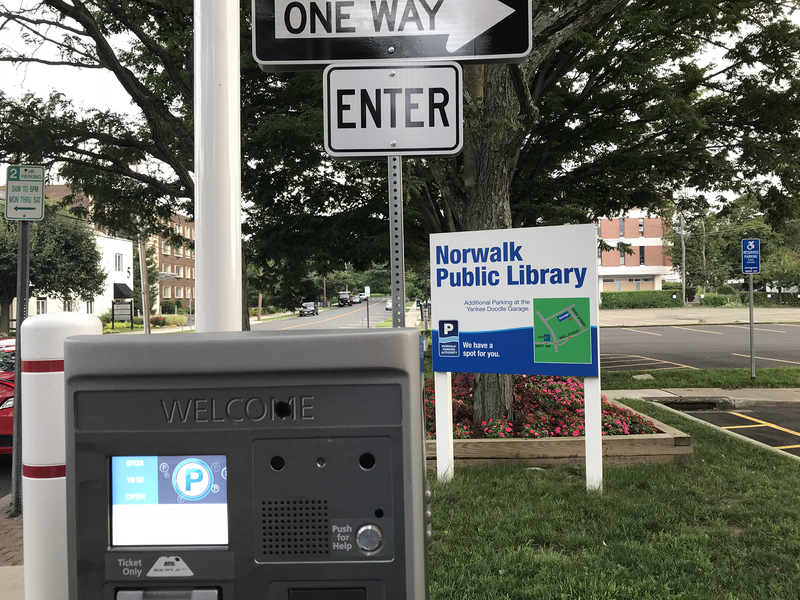 Library patrons can get their tickets validated for free parking while they are using the library; others pay the rate (50 cents an hour) that the Norwalk Parking Authority charges in its other lots. A just-completed mural at 21 Isaac St., on Wednesday afternoon. The side of an Isaac Street building has been transformed into a canvas depicting an alternate future. 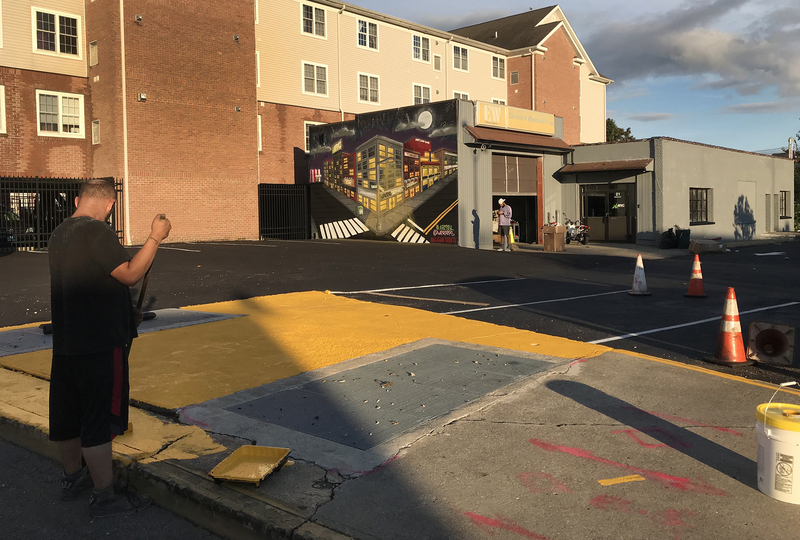 It took an unnamed artist two days to paint a mural at 21 Isaacs St., starting on the rainy Tuesday and completing it Wednesday, real estate broker Jason Milligan said late Wednesday. The building was previously hidden behind a blighted building. “That corner” is the corner of Wall Street and Isaac Street, now dominated by the partially-completed Wall Street Place phase I, wrapped in Tyvek. Milligan’s version shows a series of separate buildings occupied by entrepreneurs who are currently enlivening the area. Workers paint the parking lot at 23 Isaac St. Wednesday afternoon. 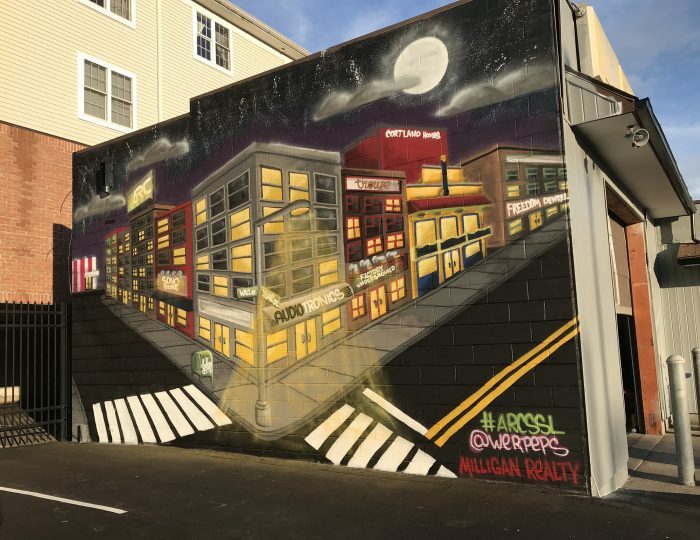 The mural on the side of Electrical Wholesalers (EW) is adjacent to the parking lot formerly owned by the City that Milligan bought recently from Richard Olson of POKO Partners, prompting a lawsuit. The Norwalk Redevelopment Agency and the City have sued the pair, alleging a violation of the Land Disposition Agreement for the property in the sale. Milligan recently demolished an old building at 21 Isaac St. This, too, is in dispute, with Milligan charging that the City tried to improperly void his demolition permit and the lawsuit claiming that he violated City ordinances in the demolition. A dentist would like to rent space from Milligan but current Zoning regulations prohibit first floor medical offices in the Central Business District A Zone. This may change soon, as the West Avenue/Wall Street plan that is getting its finishing touches is said to propose allowing first floor medical offices. The artist didn’t want to be identified, he said. Milligan is also fixing up the parking lot, with sealcoating and new striping. You can weigh in on the future of the Norwalk Library by spending five minutes (or less) on a survey, according to a press release. “Now that we have secured on-site parking and preserved for the next five years an opportunity for physical expansion at Belden Avenue, we are launching this second phase of our planning project for the ‘Library of the Future’ by inviting members of the Norwalk community to recommend their vision for the library’s future development,’” former Mayor Alex Knopp, President of the Library Board of Directors, said in the release. The city recently settled a lawsuit against Milligan, spending $460,000 to acquire a 6-year-option to buy 11 Belden Ave. The parking lot next to the Norwalk Public Library was subsequently upgraded and expanded. The library planning coincides with Wall Street area redevelopment efforts, the press release said. “The NPL serves as the anchor of the Wall Street area and should help to attract the type of entrepreneurial businesses, cultural ventures and residential growth that the City desires here,” Knopp said in the release. “The library’s previous strategic plan was completed in 2002 and the main library was last renovated in 1982,” said Christine Bradley, Library Director. “It’s time to plan the future of our library by surveying community opinions as widely as possible. We’ll be inviting our library card holders to take the survey on-line and we’re asking as many organizations and networks as we can identify to circulate our survey to their members,” Bradley said. Library Development Solutions, a “leading Connecticut library consulting firm that had been engaged by the NPL during the 2002 strategic planning project,” helped develop the survey for a $26,000 consulting fee, funded by the Norwalk Library Foundation through private donations, the release said. Library Development Solutions will assist in the planning for eight to 12 months. LDS will also consider Norwalk’s changing demographics and the digital revolution, the release said. Once the survey’s results are analyzed, consultants will facilitate small focus group meetings, interview elected leaders and “work with the Board and staff members to create a road map for the success of the library over the next several years,” according to the release. NancyOnNorwalk contributor Harold Cobin sat in on last week’s Traffic Authority, where he learned about progress of mall construction and a state paving snafu. Brookfield Properties Retail Group, formerly GGP, builds the outside of its mall while its tenants are responsible for constructing their retail space, Doug Adams has said at multiple meetings. If you’ve been driving by there, you know: the mall’s exterior is coming along. In November, anchor Bloomingdales will begin construction in its space. The SoNo Collection is expected to open about a year from now. The state paved over the ‘Don’t Block The Box’ box markings on Route 1 at France Street. The “Don’t Block the Box” markings were installed at the intersection of France Street and Route 1 in mid-2016 with the goal of reducing congestion at that difficult intersection. The city wants the state to pay to repaint the markings, Cobin said. I live in Cranbury. The Belden Hill library is my branch. I go to the library weekly, but not the Belden Hill branch. The Belden Hill branch should remove the wall that obstructs patrons views of the gorgeous front windows and classic moldings of this Carnegie building. Currently that prime front space is used for offices; patrons get no windows of consequence on the main ground level. The $600K for the parking lot was a waste of money. I use Wall St/Mott as a cut-through to Connecticut Ave. Regardless of the day or time I drive by, the lot is mostly empty. A vibrant, thoughtfully developed Wall St, will do more to bring in patrons. The Belden Hill library has to think bigger. It’s competing against libraries in Westport, New Canaan, Wilton. It will not get broad community support unless it has broad and vibrant community offerings. I do not want my taxes to increase to support these changes. It’s too late, they’ve lost me, and far too many of my neighbors, already. Great changes need to come from foundations $$$ and public/private collaboration with development in Wall Street. I don’t care for the mans tactics or self promotion, but he’s got a more workable idea than any other one I’ve seen. He’s won me over with 4 story buildings (not 6!!!) that actually look like the belong there, and local businesses in the storefronts. This guy paid a couple grand for a mural and the side of a building and its a more coherent plan than 15 years of studies and millions of dollars of plans and developers. Incredible. Pure genius. For or against him, I love the gritty, unconventional tactics Mr. Milligan uses via the mural. No fancy power points, studies to study the study that should have been studied and implemented…. Bam, in your face vision and shaming for where Mayors King and Rilling as well as town lawyers are taking Mr. Milligan. I’d suggest he takes the public shaming of Norwalk Town Government 1 step further regarding the absurd Dentist Regulations: borrow a page from the Park(ing) Day concept and “rent” 1 or 2 parking spots along Wall Street. Have a dentist do dental work and light cleanings right out in the street in the parking space. Or, because the cleaning equipment and dentist chair could be a hassle, set up a good hygiene/ dental 101 type pop-up information table and pay a hygenist or 2 as well as a dentist to work the “booth” in full medical attire/”scrubs”. Here is what a Park(ing) Day is and I’d suggested it for Sono or Wall Street previously. Tony P, Kevin Kane… Couldn’t agree with you more. Self promoting sometimes he is, but Mr. Milligan’ s mural concept with the input of the residents and business owners of Wall Street is brilliant. Good for all of them! Great progress! Thank you. It does not go unnoticed the amount of heart you all have put into this mural. The design illustrated on the mural checks all the boxes. Design is more appropriately scaled (four story, not 6 story and up, buildings) and is harmonious to the existing landscape. It’s integration respects and showcases already existing cherished businesses which we do not want to leave. The design appears inviting and catalyzing to other businesses who would consider coming into the Wall Street area. The depiction seems to address the parking dilemma which the business owners were concerned about in the Wall Street meeting last Monday. The design exhibits a vibrancy of multiple store fronts, which would encourage bustling foot traffic that would not be possible if a massive fortress building sucked up that opportunity with it’s disproportionate footprint. What is depicted on this mural Is a cluster of an Innovation District, ignited by a group of people who have invested in the area and who collectively care enough about Norwalk to fill a void and stand in as Wall Street’s unofficial Economic Development team. Who cares if the proposed cluster is on a building’s wall instead of on a piece of paper? The important message is that it got done with true innovative (Yes!!) spirit and a sense of urgency in a way that gives Norwalkers hope and makes them feel heard in what should be an exciting and transparent process which involves everyone’s input, and not a process that is exclusive, lacks creative vision, and is controlled behind closed doors. It took two days for the big picture vision design to be illustrated by the muralist, but I acknowledge that the mural is a manifestation of passion, research, genuine engagement with the business owners and residents at meetings, an understanding of the pulse of the neighborhood, and a realization of the value of the business owners’ and residents’ feedback. I appreciate the effort immensely as a fellow engaged Norwalker. In sharp contrast, it took a large number of individuals at City Hall over a year’s time to discuss an Innovation District behind closed doors in the absence of a strong Economic Development Director, and yet somehow not flesh one out at all. After a year’s time, Mr. Sheehan and the Common Council crafted and presented a vague, ill conceived Innovation District Ordinance which promises to incentivize more developers by waving more of our taxpayer dollars at them. I am disappointed that Mr. Sheehan appears to only have eyes for apartment developers and wants to see more density come into the area. The proposed Innovation District Ordinance gives too much power of decision making to Mr. Sheehan and the Common Council in an area where they are not qualified to make said decisions (Help!! Can we get an Economic Development Director in here YESTERDAY pleeeasssse!!!! ), and dismisses the engaged public input on the POCD Survey (Mr. Sheehan so much as said that… Question 10 of NoN interviewing him… we haven’t forgotten the dis!). Norwalk deserves Excellence. City Hall seems unable to get out of it’s own way regarding POKO 1. Are they too busy scapegoating and suing a man with a vision who has resonated with the community to give the city what it needs? Citibank should be sued and ordered to demolish that pathetic structure which is a kick in the teeth to all surrounding businesses and residences. That blighted eyesore structure is bringing the community down. It would never have been gotten away with in the surrounding affluent towns. Why do Norwalkers deserve less than, City Hall? Answer me that. Enough already! Let’s get serious here and support the people of big picture vision who are making some remarkable progress. @Jason Milligan – at the very least, thank you for the beautiful street art. A truly urban form of expression, this thoughtful imagination – this mural – presents a vibrant vision of “what can be”’ and really demonstrates the artist and developer are truly listening to the Wall Street community. This is a very generous, unique – and unexpected gift to the city. There is even a cherry on top – define irony. The more the Mayor & Mario try to bully and silence this creative entrepreneur, the more the average taxpayer in this city sees how shallow, limited and incompetent our city hall team is when it comes to strategic land-use & development. Amateurs. The more they push secrecy & party politics – the more they bully – the more likely this team will lose the election. Best part? They won’t see it coming. I look forward to seeing what this artist can do with a wheelbarrow full of pink slips…. You have sent out official signal of distress the flag is upside down we all agree the city has waited long enough this mural is a work of art . Thank you Jason and to The artist. Not only did the State neglect to repaint the “don’t block the box” stripes, what about the two foot strip of busted up pavement they didn’t pave between the end of France Street and the intersection? It seems neither the City nor State own that strip. Ridiculous! As corny as this may sound, the thing that immediately caught was the size and placement of the streetlight. It leaves the sidewalk free for activity without obstruction, or impeding would-be activity such as walking and cycling.